I heave along the Forest Path, rising through the shale and grit to the sandstone benches above the coastal plain. There, where the rocks cup the water, and the canopy above catch the clouds, you will find twisted boughs and hanging roots of Sandpaper Figs and Butterwoods. At dusk, the sun dips below their leaves and licks the surface of each little puddle and pool. Cakes of algae and autumn leaves flash argent, turquoise and olive greens. Boatmen whisk up ripples that radiate out the colours like little kaleidescopes. The air is still and dense with sweet clouds of volatilized nectars, and coloured by plumes of ochrey dust. Flakes of bloodwood bark tumble to the stony soil below, whilst babblers and fledgling butcherbirds rollick around the nearby mulgas. Spring in Centralia brings a frenzied scurrying of ants and tireless buzzing of bees and wasps that inspires life. It brings fresh, vibrant, radiant sprays of turquoise, mustard, lemon, tangerine, maroon, coral blooms, caked with sticky pollen. Spring in Centralia brings dusty imprints of dog and emu prints in the damp clay; it brings children laughing and gallahs squabbling, drunk on seeds and nectar like so many larrikins at the local pub; it brings a vast, extensive, inimitably endless blanket of Wahlenbergias, peas, Indgoferas, Malvaceas and Asterales – a rainbow cape on the harsh, red, rocky range of Tjoritja. Anyone who has even a passing acquaintance with me will know too well how passionate I am about anything botanical – especially when it involves a long bushwalk in spring when the flowers are out across sandstone country of the Dharawal Nation. Whilst preparing these templates I discovered something lovely: it was the process of coming up with the design itself that was rewarding and expressive, and not necessarily the final carved and printed image. In fact, the templates are the artworks now, and I have no intention of preparing a plate of them. My next step is to curate a set of about 10 images and print a batch (signed and limited edition) for sale. I don’t know how much to sell them for, but what I do know is that any profits I make will go entirely to a managed fund to support undergraduate botanical research at UOW. I do my research on a shoestring and it’s largely funded from my own wage. I regularly take on three Honours students a year and I want to contribute to their important work in vegetation conservation… i’d love feedback on whether or not this a viable proposition. A vast stony plain shivers, strewn with tousled clumps of sclerolaena and dead-finish shrubs. A wall of aching, stout redgums snakes a trench of quartz and mica and gypsum through the heaving, bronzed sandstone spine of the Tjoritja. Their boughs ache with sticky, cakey bark, festered with lerps and ants, and dark with ashy charcoal. Sallow, grizzled corellas lounge on the rim of a dusty hollow, preening their scabby feathers with flaking beaks. A princess parrot clambers into a gash in the side of a tangled regum, flashing pale pink and olive against shards of heavy sunlight. There has been no water here for a year. Mounds of sand and dust are strewn about the creek, heaped with beefwood pods and caltrop burrs. Iridomyrmex and Rhytidoponera glint emerald and turquoise as they thread between the pebbles and grass culms, carving a cricket’s carcass into littler bits as they march by. The birds are quiet today and there are no roos or dogs about. A mass of crinkled, brittle grass heads nods about, breathing the heavy, sticky air. Buffel grass tufts, thick and stout, squat about the place, ruffled by the breeze that sighs over the stony floodplain. A lone gallah hobbles about these grasses, hoists up a stumpy claw, grabs a culm and strips it with its beak. There are no grass seeds to eat today – all are empty glumes. The sun beats down; the heat stifles even the retching cries of crows and babblers. The creek is an oven of shadowy, pendulous, brittle redgum leaves and crisp swathes of buffel grass. A grey, foggy plume of ash rises above the tree line, mixing with the wavering mirage of heat on the sweaty horizon. Its distance is uncertain but you can taste the smoke. Then, a tangled panic of birds rises from the treeline, directionless, erratic. There is a dull roar some way up the creek, like blood-flow echoing around a shell at your ear; then, a crackling and snapping, like a fist pumping up a sheet of cellophane; then, a rush of wind and dust, and a heavy haze of orange, dirty smog engulfs the bleeding redgums. There are dull thuds of branches hitting sand, of hooves on the clay, of hollows splintering. Fledged princess parrots and ring-necks squeal, then grow silent. Then the thirsty tongues of red and orange and blue and yellow flames lick through the branches and tear at the buffel grasses and devour the canopy. Three months on and the sandy creek-bed blooms in a carpet of freshly-shot buffel grass seedlings, growing stronger and faster than they did before. The hollows are empty. The cattle have come down to feast on the buffel grass shoots. Purple inflorescences are already bearing ripe, swollen fruit. There are no native seedlings, though – the fire was too hot, the seeds too delicate. There are no resprouting shrubs – their volatilized branches leave all but a faint, ashy silhouette on the creek’s sandy face. It’s July in Central Australia. The ground is moist with morning dew and the skerricks of rain from last month’s cold front. By mid-morning the sun is heavy and the sand is warm, despite the night’s frost. Hakea blossoms drip with nectar, and the air heaves with babbler birds squabbling and butcherbird babies gurgling. A falcon feasts on a freshly-fledged chat in the crook of a bloodwood.Simpsons Gap heaves with life. Buffel grass (Cenchrus ciliaris) is an invasive plant that was introduced to vast areas of inland Australia to ‘improve’ the grazing potential of the landscape for ranging cattle. It’s a perfect storm of a species: rapid growth, ability to persist in extremely dry, hot and dusty deserts, ability to resprout post-fire, a vast and deep root system with which to compete with native plants for what limited nutrients and moisture exists in these ancient, arid soils. Now that the cows are gone and the pastures lay abandoned, buffel grass infestations have burgeoned across the river flats and alluvial plains and rocky slopes of the ranges. The blanket of hay and dead canes heralds the end of a flush of buffel grass growth, followed by an extended period of little to no rain… a perfect fuel for a hot, expansive and severe fire. Buffel grasslands burn often, and when they do it is hot and fierce and fast. If you are a lone pine or Hakea or Atalaya, standing amidst a sea of buffel grass, you are burnt often and most likely die. The holes left by the dead shrubs and trees are almost instantaneously monopolized and filled by buffel grass seedlings. The more holes that are filled and the more space that buffel grass covers, the hotter and faster and fiercer and more voraciously consuming the fires become … a positive feedback of invasion-begets-fire-begets-invasion-begets-fire that drives the demise of the few natives that can persist in this harsh, infested landscapes. We know that invaded areas contain far fewer native plants than once grew on these river flats. We know that the fires are fiercer and hotter and the native trees are burning to death amidst a sea of buffel grass. We know that these dead trees are not replaced by seedlings. Why? Why don’t the adult plants get replaced by seedlings post-fire? Is it because buffel grass inhibits the germination of the native seeds from the soil? Do the seeds germinate but rapidly die when faced with indomitable competition from buffel grass? Another unexplored explanation: buffel grass-invaded areas may be limited in the abundance and diversity of seeds in the soil. The adult trees, floundering in a sea of buffel grass, may simply not produce enough fruit to replenish the reservoir of seeds in the soil (or they do but the seeds cannot get to the soil), such that when the trees and shrubs die there are few opportunities for seedlings to germinate and replace them. Many of the animals that plants ‘use’ to disperse their seeds long distances may visit invaded areas less frequently (or not at all?) than they once did. Does buffel grass invasion impact on the soil seed bank? On this warm winter’s day you can see a head lolling around in the grass. Kaisha Edwards is nestled beneath a bloodwood, covered in tree sap and red, powdery soil. Meat-ant sisters scurry about her boots, foraging for corpses of grasshoppers and moths, and the fallen, rotting berries of Encylaena shrubs. Her shoulders heave up and down as she digs another trench. 479 to go. The soil is dug out, strewn across a sieve and shaken to separate the seeds and rocks and leave and twigs from the sand and silt. Kaisha and I have come to Alice Springs to hunt for seeds. Along with the leader of our buffel grass research Dr Christine Schlesinger at CDU, we seek to discover whether invaded areas contain the same set of seeds in the soil as non-invaded areas. This work may crucially enable us to determine the pathway by which buffel grass causes long term declines in native plant populations. Does buffel grass cause a decline in the density and identity of seeds in the soil? If not, the decline in populations is probably linked to suppressed seed germination of seedling mortality, not disrupted dispersal of seeds to the soil and their storage below-ground. Back in the lab, Kaisha and I (and some wonderful volunteers) will arduously and carefully extract and identify all the seeds from each core. We are already observing an apparent trend towards reduced seed abundance in buffel grass-invaded areas, but we won’t hold out breath just yet. We thank CDU for their generous hospitality during our recent research expedition, and Christine Schlesinger for her enduring support of our collaborative work on buffel grass. I also wish to warmly thank the Hermon Slade Foundation for supporting our work on understanding the mechanisms by which buffel invasion invasion disrupts recruitment dynamics of native woodlands in the Red Centre. Weedy woes and ecosystem rehabilitation – what are the biophysical consequences of woody weed management? It is well known that invasion of ‘natural’ vegetation communities by non-indigenous plants (commonly termed ‘weeds’) significantly threatens native vegetation diversity and ecological function. It is widely assumed that restoration of native vegetation can be facilitated through weed removal, but it is clear from recent evidence that removal of a weed alone is unlikely to restore resident ecosystems. Indeed, it has been estimated that as little as 20% of management activities are quantitatively evaluated for community responses to weed removal. More often than not, ‘positive conservation outcomes’ are evaluated in terms of how much biomass of a particular weed is cleared from a particular area, with little consideration given to the degree to which the community regenerates once the weed has been removed. At the start of this year I began an investigation on the patterns of native vegetation responses to weed management, in collaboration with ecologist Kris French and human geographers Nicholas Gill and Natalia Adan from the Australian Centre for Cultural Environmental Research (AUSCCER) at the University of Wollongong. My project is couched within and complements an overarching study on the complex social and cultural drivers of weed invasion and management systems across rural landscapes (see detailed outline of this project here). 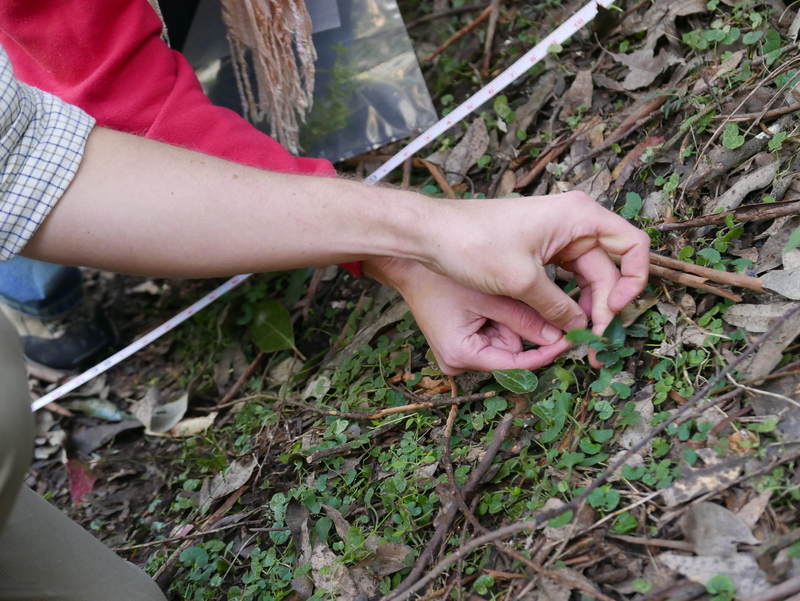 My specific project will examine whether and how native wet sclerophyll vegetation regenerates in response to removal of the thicket-forming shrub Lantana camara (lantana) by private residents across semi-rural and forested landscapes of south-eastern Australia. This will be achieved through detailed vegetation censuses across a diverse array of vegetation plots from which lantana has been removed, as well as reference invaded and relatively intact patches dominated by native forest. (I am a bush-pig at heart and have a rollicking good time when rummaging around forests, collecting data on plant communities – if you fancy being pinged with photos of a bearded boy head-deep in lantana, covered in ticks, leeches and scratches but exploring the most extraordinarily beautiful landscape, follow me on Twitter @GoodenBen…). Does time heal all wounds, or only at some places some of the time? Fundamentally, I expect that the plant assemblages that emerge once lantana is removed will be richer and more structural diverse than those present in lantana-dominated patches of vegetation. 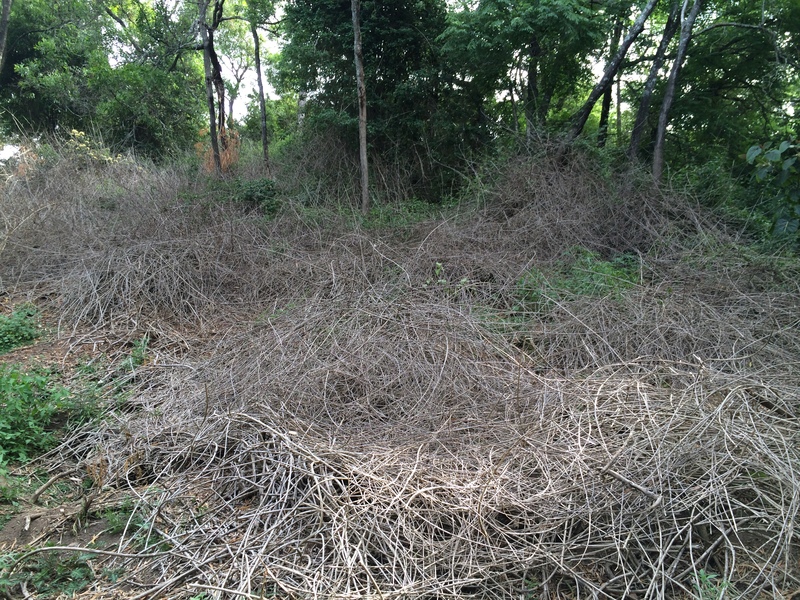 Indeed, I have been shocked at how rapidly native plants (grasses, sedges and forbs in particular) recruit into plots once lantana is removed (see image below, taken before and then only four months post removal)! I will survey vegetation along a chronosequence of lantana management (before removal and 1 to 20 years post removal) to determine the temporal scale over which native communities recover from invasion. However, it is clear from recent evidence that the patterns of community regeneration in response to weed management is moderated by at least three key attributes: (1) mechanism by which the weed is removed (see classic example here), (2) landscape context and (3) ‘resilience’ of the community to invasion. For instance, we are finding that lantana is removed either mechanically (sometimes using heavy machinery, such as tractors and slashers) or chemically, and I anticipate that the pattern of vegetation response will differ between these two control methods. Disturbance of the soil, through mechanical removal, may activate seeds stored within the soil and facilitate native plant recruitment. Alternatively, mechanically-controlled sites may become dominated by secondary weeds, as a result of soil disturbance, which inhibit recruitment of native species… we do not know what to expect, but I predict nonetheless that these two modes of weed management will have divergent trajectories of native vegetation restoration. Other methodological factors that may influence how the vegetation recovers post invasion include: how long was lantana present prior to its removal? How much lantana was removed, and how often; once only, or were follow-up treatments used to prevent it from re-establishing? How many practitioners participated in the removal programme? Likewise, we are finding that lantana removal is conducted across a gradient of vegetation cover within the landscape matrix, and I anticipate that each managed site’s landscape context will moderate patterns of community regeneration post lantana removal. Sites embedded within a forested matrix are likely to contain a diverse and abundant suite of plant propagules within the soil seed bank and higher rates of visitation by avian frugivores than sites located in extensively cleared landscapes. Will forested sites thus experience faster rates of vegetation regeneration once lantana is removed compared to managed sites with little residual vegetation in the surrounding landscape? My overall aspiration, therefore, is to determine optimal regimes of woody weed management with regards to promoting native vegetation regeneration across invaded landscapes. Through extensive vegetation surveys, coupled with complex general linear mixed models, I will attempt to develop a model of vegetation regeneration, based on where, when and how lantana has been removed, as well as landscape attributes and functional traits of the native plants themselves. Weed management is as much a function of the people who engage with the weed as the native vegetation that are impacted by the weeds. I wish to acknowledge the fabulous work that my colleagues Nick Gill and Natalia Adan are doing on working with local land managers and private custodians on weed management systems and landscape change. I’m a bush boy who is still grappling with objective realities versus entangled ontologies, but I am learning to be more open to understanding how ecological and human cultural systems are entangled, not separate – and I thank them for this opportunity to play a part in their research. If it were not for the work of scientific illustrators, we would have very little documentary evidence for the existence of dodos and several other now extinct, bizarre and charismatic species (Hume 2003). Indeed, the image on the right is purportedly the earliest depiction of the dodo, sketched by Joris Joostenz Laerle during a voyage to Mauritius in 1602, (housed within the Nationaal Archief, Den Haag). Remarkably, physical evidence for the dodo is restricted to a dried head and a couple of feet, which hardly gives us an insight into the unique life history and ecology of this bizarre bird. Contemporary studies of this species’ ecology and life history depend largely upon illustrations made three to four hundred years ago. Imagine how natural history and modern science could have progressed without such images being created and curated for posterity? Banks’ botanical expedition to eastern Australia and Darwin’s work aboard the Beagle were enriched by such illustrations and captured the imaginations of their contemporaries. I recently joined the Twitterverse and have discovered a rich community of scientific illustrators in Australia. Their work invokes the romance of naturalist explorers hunched over parchment on rolling ships, deep in thought, brows furrowed, pencils in hand, trying to capture the essence of unique, alien specimens, aided only by the light of a flickering candle.